"There was also a ski lift (rope tow) at the Forest Hills Hotel in Franconia (on the north side of Rt 42, 1/2 mile from the intersection of Route 18) in Franconia. This was used by the guests at the hotel, as well as by the kids from Dow Academy, like Norwood Ball, Bert Herbert and Bernie Herbert. Later, it was used as a sledding hill. There was a ski jump across Route 18 from the Forest Hills Hotel, which was part of Dow Academy. The slope was almost next to Norwood Ball's house." Here's a topo map of the area. I aligned the picture so it looks like you are looking up the slope. Sylvia Needel has some more information: I was a student at Franconia College (housed in the former Forest Hills Hotel) in 1965. The ski slope was still there, used most often by students sledding on cafeteria trays. On weekends when there was enough snow, someone would fire up the rope tow, and I remember skiing there on several occasions. It was a nice slope, wide with a fairly steep pitch and just long enough to make you wish you were over at Cannon Mountain, a REAL ski area. 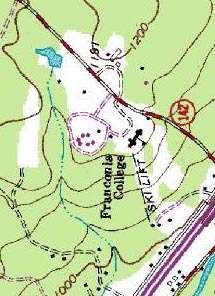 The college closed, and when I returned to Franconia in the early 1990s there was nothing left but a hole in the ground where the building was, and the little ski slope was overgrown with trees. 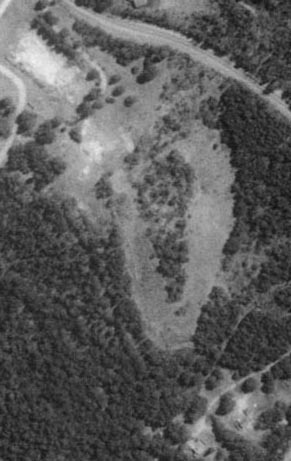 Here's an overhead view of the slope. You can see the rope tow line in the woods to the left of the two main slopes.